#2 First Pocket Money Market – report back. On Saturday 28 February Live Lightly held its first Pocket Money Market for young entrepreneurs. Garden stalls were available for children up to 16 years old at just R5 and they were encouraged to try a variety of goods and services to experiment and gain experience. I had 18 stalls booked but many others arrived on the day, I think we must have landed up with as many as 25 stalls and 40 young traders. It was an experiment initiated by my eight year old daughter Anna only a week ago, so we really made it up as we went along. Given the short notice and the large number of spectacular event in Cape Town this weekend, I was a little overwhelmed by the turnout of both traders and shoppers and absolutely blown away by the originality, quality and effort that went into the stalls. I had planned it to be low key and to nurture the entrepreneurial spirit in a gentle, safe environment and to keep costs down we had it in my little garden in Milkwood Park. This was all great and it worked well with people travelling from the far northern suburbs to participate. Everyone is already asking when the next one will be and some even want a weekly event! I will however have to find a suitable venue and ideally a sponsor as I think a stall fee of over R20 would defeat the purpose. The stalls were charmingly decorated with lovely little details such as business cards and clever sign boards, samples on offer and eye catching displays. Goods on offer covered a huge range. There was an array of wonderful baked goods and treats and some interesting twists like gluten free and allergy specific products, fresh herb tussie mussies, and the ever popular ice bites were a fast sell-out. Craft items had clearly been made with much pride and included mobiles, beadwork, candle holders, jewellery, fridge magnets and a variety of beautiful décor items. Many children are clearly green fingered and there was a super selection of plants from heritage beans to succulents and air plants which were very popular sellers. Other items on offer were play dough, bath bombs, bandannas, hats, purses and accessories and much more. There were some very clever activity based stalls too and some children used the opportunity to trade the games, toys and books they had outgrown – I think there is potential for an entire play station section! 10 year old trader Skye Wareham, selling lucky packets and raffle tickets, even used the event as a fundraiser for her cheerleading team. In the “services” section were henna and gel tattoos and massage which had to run waiting lists as they were so popular. Excitement during set up was huge and once trading began there was some fantastic sales patter, intense concentration working out change and a whole lot of explaining about keeping float and profit separate and not spending your takings! The children were soon comparing prices and getting in to the marketing swing of things, upselling and proactive selling. Customers were very supportive, chatting seriously to the young traders about their business and spending generously with some successful business people giving wonderful feedback. Isabella Swain ( 5) ” Isabella’s Lullaby” and Luca Bailey, (3) “Luca’s Playthings” joint winners of most sales of the day. Iainn 9 & Stefan 8 Breedt winners for best salesmanship and most innovative products. 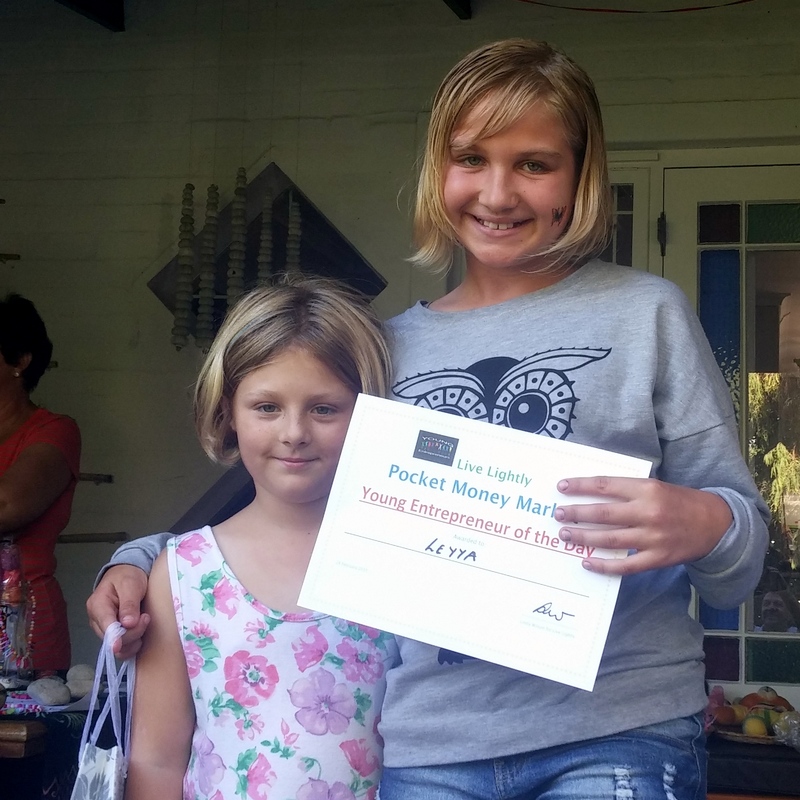 The overall Entrepreneur of the day was awarded to Layya Haarhof (11) of Bay Primary School. Leyya set up a tranquil space where she gave outstanding head, neck and shoulder massages. Her presentation, professionalism and special talent made her a winner. Finally I must give a special mention to my daughter Anna (8) who was not allowed to participate in the competition but received many nominations from people who did not know she was “staff”. The concept was really her idea and she made all the sign boards and adverts and did a lot of the organising too. I would really like to take this concept further and expand it to include some pre market talks and advice from successful entrepreneurs and there are clearly a lot of enthusiastic, creative children with heaps of potential. Unfortunately I was so busy on the day that I did not take many photos but I have a few snaps: https://www.facebook.com/media/set/?set=a.665072270269926.1073741859.528753983901756&type=1. Next > Animal Testing – Does The Cost To The Animal Justify The Research? Make An Informed Decision.